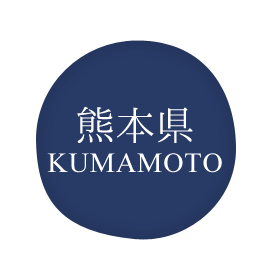 At the center of Kyushu lies Kumamoto Prefecture. Nestled between the bountiful Ariake Sea to its west and the Kyushu Mountains to its east, it is an epicurean's dream come true with its assortment of seasonal fruits and vegetables, livestock and fishery products all year round. Kumamoto also has a unique culinary culture all its own, best represented by Taipien and Ikinari-dango. Local home-style dishes like basashi, a horse sashimi dish, and karashi-renkon (lotus root filled with mustard and miso paste) pair perfectly with sake. The recent introduction of Kumamoto oysters to the market illustrates how the prefecture is continuing to expand culinary horizons in Japan. The magnificent Kumamoto Castle built by Kato Kiyomasa is one of Japan's three greatest castles and stands as a towering symbol of Kumamoto. The influences of Chinese culture are clearly reflected in the Yatsushiro Myoken Festival, an event like no other in the world. Tradition is alive and well in Kumamoto where they still make Shodai-yaki, a pottery originally crafted by order of Hosokawa Tadatoshi, the first lord of Kumamoto Domain within the former Province of Higo, as well as Higo Zogan (damascene), a technique of inlaying gold and silver onto iron base. Once a popular destination for the cultural icons of Japan's Meiji era, Kumamoto is home to the former residences of Natsume Soseki and Lafcadio Hearn. There is no tour to be held right now.